The Golden State Warriors are stocked with eye-popping talent on the hardwood. But "Dub Nation" can't seem to take its eyes off of the organization's most popular star: a former middle school teacher with tortoise-shell glasses who is also a San Francisco Peninsula mother with hips that swivel like nobody's business. Without a care in the world, Robin Schreiber has seized the dance cam spotlight on the Oracle Arena Jumbotron more than 20 times since the beginning of last season. 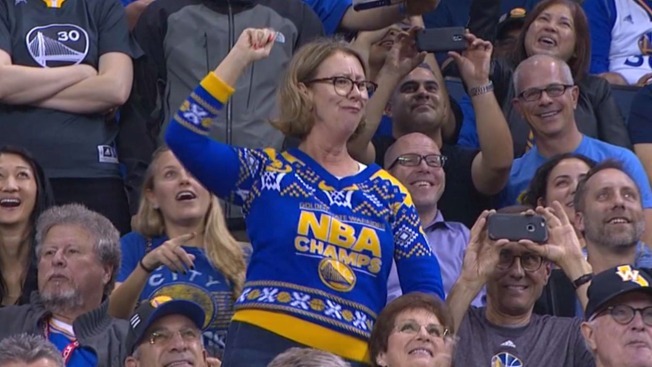 Clad in her coveted Warriors-themed Christmas sweater, she flaps her arms, pumps her hands into the air and preserves a calm game face all the while delighting raucous "Warriors Ground" crowds. People can’t help but gawk at her gyrating gestures. "Right before I stand up, I feel — this is the honest-to-God truth — I feel like, 'Oh my God, I am so ridiculously stupid, I should not do this," Schreiber admitted to NBC Bay Area. "And I just shoot up and then kind of like get into it. It's really like nobody's watching me." Schreiber's infectious dance moves recently flooded social media, transforming her into a viral sensation in a matter of no time. Her son, JP Schreiber, says he's not one bit surprised. "I think she's always had it in her personality to do this," he said. "She's had a tendency to break it down in the past." Robin Schreiber, an Oakland native, is relishing her moment of stardom. She even jokingly believes that her skills are compatible to a beloved Golden State star's sharp-shooting prowess on the court. "When (Steph Curry) makes a 3-pointer, the crowd cheers, but I think I'm giving him a run for his money," Robin Schreiber quipped. The Redwood City resident has been showered with praise by several admiring fans. She is especially tickled to know that she is bringing a smile to baby boomers like herself. "In the hallways of Oracle Arena and in the women's restrooms, people come up to me and say, 'You stand for us mothers. The Warrior Girls, you know, everybody that dances is always beautiful and young and you're just not afraid to stand up there and do it and we know you're a mom," people tell Robin Schreiber. The one-time teacher, who called the classroom her home for 35 years, has also generated quite the buzz among her former students on Reddit. "A lot of them were saying, 'Oh my God, I think that's my teacher! Yes it is, I know that's Mrs. Schreiber. I'm glad to see she's still kicking it,'" Robin Schreiber said. JP Schreiber appreciates that wild and wacky side that his free-spirited mom flashes, especially when complete strangers are watching. "She sets a good example that, at the end of the day, you just got to try to make (life) the best you can and have fun," he said. That now-famous Christmas sweater, by the way, was supposed to be gifted to JP Schreiber after the Warriors were crowned NBA champions in 2015, but Robin Schreiber commandeered it when her husband mistakenly bought it in a women's size. Not only is it a "lucky" garment (just look at Golden State’s record since its title run), the "threadbare" piece of wool happens to give Robin Schreiber a boost of confidence. "When we put the sweater on, it kind of gave her that last extra push to really just kind of get up and be ridiculous," JP Schreiber said. As for Robin Schreiber's arsenal of hula-dancer moves (think: those little dolls wiggling on your dashboard), she concedes that she may not know what she's doing all the time when the camera pans her way. "I'm not a professional," she laughed. "I've never had any lessons. That's obvious I think."